Kristie O'Brien, Arizona State Senate Candidate, LD-17, Opponent Steve Yarbrough is Out of Touch with District Voters. June 30, 2014 - Today, June 30, 2014, marks the deadline for initial financial filing reports to be disclosed to the Arizona Secretary of State’s Office. It also became the day the U.S. Supreme Court would issue its controversial 5-4 ruling in the Hobby Lobby case. Steve Yarbrough’s sponsorship of Arizona’s discrimination bill, SB1062 earlier this year showed he was out of touch with Arizona’s legislative needs when he was willing to put Arizona’s economic well-being, business climate, reputation and community at risk to serve the ideological needs of special interests. The initial financial filing of his campaign shows he is also out of touch with the voters of Chandler, Sun Lakes and western Gilbert. Essentially all but 3 of his individual donors were located outside our legislative district! 90% of his money came from Political Action Committees (PACs). Steve Yarbrough serves special interests and self-interests, by personally financially benefiting from legislation he directly sponsors. Despite his conflict of interests and controversial legislation that risked $1 Billion to the Arizona economy, very few are brave enough to take on a Committee Chair to end the practice. I chose to run for my hometown district to restore fiduciary duty to the office, maintaining the strictest ethical oversight of taxpayer money, to promote a strong business climate and to protect the well-being of all Arizonans. I am happy to report that Legislative District 17 voters are standing behind our grassroots efforts to restore integrity and accountability to this Senate seat and are financially supporting my candidacy. 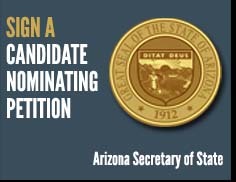 To learn more about Kristie O’Brien and how to support her candidacy for the Arizona State Senate - Legislative District 17, please visit: www.OBrienforAZSenate.com.